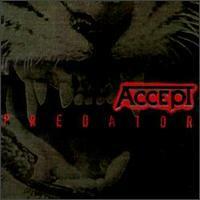 Predator is the eleventh studio album release by German heavy metal band Accept. It was released in 1996, produced by Michael Wagener and recorded at 16th Ave. Sound Studios, Nashville, TN. Predator was Accept's last album before their hiatus from 1997, and their last recording with singer Udo Dirkschneider. Drums and percussion except on "Primitive" and additional percussion on "Predator" were by Michael Cartellone from Damn Yankees and Lynyrd Skynyrd.